Gautam Gambhir criticised Mehbooba Mufti on Twitter after she lambasted the BJP over the PIL filed against her and other J&K leaders in Delhi HC that seeks a ban on them contesting in the upcoming Lok Sabha elections. 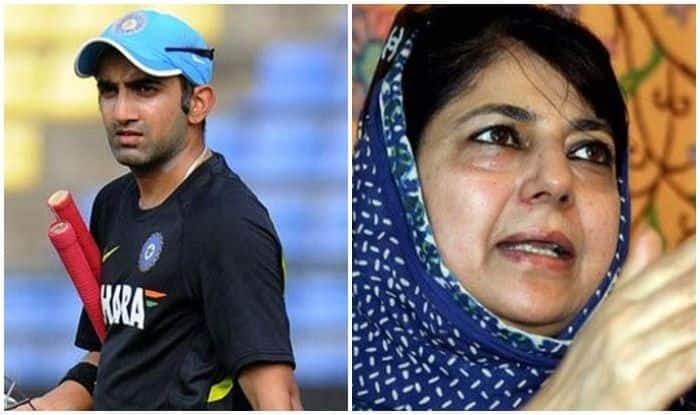 New Delhi: Cricketer-turned-politician Gautam Gambhir and former Jammu and Kashmir chief minister Mehbooba Mufti engaged in a verbal spat with Gambhir calling the latter a ‘callous individual’. Gambhir took to Twitter to vent after he was blocked by Mufti following a verbal battle between them over Article 370 on the social media platform. The former J&K CM and People’s Democratic Party (PDP) chief had posted a tweet which criticised the Bharatiya Janata Party (BJP) over the Public Interest Litigation (PIL) filed in the Delhi High Court which seeks a ban on J&K leaders Farooq Abdullah, Omar Abdullah and Mufti herself from contesting in the upcoming Lok Sabha elections. Things started heating up between the two as Mufti then blocked Gambhir on her social network but ten hours later, unblocked him only to mock the former cricketer. She replied to Gambhir’s tweet saying, “Hope your political innings in BJP isn’t as abysmal as your cricket career!”. However, Gambhir hit back at Mufti for unblocking him and lambasted her for coming up with a ‘pedestrian analogy’. “It shows lack of depth in your personality,” said Gambhir. She slammed Gambhir yet again and said that a cricketer should stick to cricket and shouldn’t get into issues like Kashmir if they hold no knowledge about them. “Take your aggression to the field and once you’re done hang your boots with grace,” she said.